Kenneth carried a sketchbook with him from the time he was a small child. He was born in 1913 in Berwyn, Illinois, a suburb of Chicago, the son of an executive of the Ketterlinus Lithographic Manufacturing Company. His father too, had wanted to be an artist but instead, put aside his dream and worked his way up in the company. Although blessed with privilege, Ken had severe asthma and also weak vision forcing him to wear glasses from the age of three. The elder Becker took his son on many trips in an attempt to alleviate the symptoms of the breathing problems. They traveled to Encampment, Wyoming, Tucson, Arizona, and Sante Fe, New Mexico, among other destinations. The asthma persisted until he was an adult, but as a result of the sojourns, Ken developed a passionate love for the western and southwestern territory, mountains and deserts and old shacks, as well as a love for his own midwestern landscape. He became entranced with the power and dynamism of nature along with its delicate beauty. After studying briefly at a boarding school in Sante Fe, he returned to finish high school in Hinsdale, Illinois, where his parents and sister had moved. At the early age of nineteen, he took part in art shows in Hinsdale and Evanston, garnering praise from the local reviewers. In 1931, Kenneth began studying art seriously at The Art Institute of Chicago under Boris Anisfeld, the Russian painter. He remained devoted to Anisfeld and inspired by him throughout his life, attending his teacher's summer workshops in Central City, Colorado. He also spent time in workshops at the Monhegan Island, Maine Art Colony and at the Oxbow Summer School of Painting in Saugatuck, Michigan. He traveled during this time to the West Indies and with his family on a cruise to Colombia and Guatemala, taking photographs and filling sketchbooks. He produced oil paintings but it was the fluid medium of watercolor that held him fast and he never left behind a love of pure pen and ink drawing. His hand was natural, unforced, spontaneous, his brush strokes fast, direct and energetic, never sacrificing the feeling of immediacy. He painted with freshness, with sensitivity and vigor, working on location, from memory and from photographs. Although not aligning himself with any particular movement or school, he admired artists of all periods, from the old masters to Cezanne, Dufy, Matisse, Picasso, Wyeth, Marin and Rothko to name a few. In 1939, through his best friend, the artist Edgar Ewing, he met Lucille Johnson, a free–spirited young woman of Norwegian descent who came from St. Paul, Minnesota to Chicago for work. They were married in 1940 in Hinsdale, Illinois and eventually had four children. From the 1930's onward, Ken exhibited at various art galleries in and around Chicago, including solo exhibits at the Paul Theobald Gallery and at the prestigious Roullier Gallery. Some of his richest periods came when he traveled over several summers in the 1940's to Aspen, Colorado. He rented a miner's cabin, set up his easel in various spots around Aspen and painted, selling many works to residents and visitors. It was there that he met and made friends with Herbert Bayer, the Bauhaus designer and artist. They remained lifelong friends. Ken also exhibited in Philadelphia, where he would later go on business. As he now had a growing family to support, at his father's insistence, he began working at the lithographic and point of sale advertising company alongside his dad. After moving to Geneva, Illinois for two years where he used a barn as a studio and back to Hinsdale, he moved his family to the near north side of Chicago where he had a studio on the fourth floor of their house after installing a skylight. In truth, outwardly at least, he seemed to want the so-called good life that the city afforded. He wanted to live fully and party and he wanted what money could buy, but as a neighbor pointed out, "Ken was himself only when he was painting." Business and financial demands intruded. His wife, Lucille, claimed that when he was going through troubled periods, "painting was the only thing that could revive him." He continued to paint but he also gave in to indulgences and his affable social drinking turned problematic. From the 1930's to the 1960's, he took part in the Annual Exhibition of Artists of Chicago and Vicinity at The Art Institute of Chicago, winning numerous prizes and selling many of his works. In 1944, he participated in a two person exhibit at The Art Institute and in 1945, the museum mounted his one man show of drawings and watercolors of early midwestern buildings, which was a great success. In an introduction to the exhibit, he wrote that he was striving for "sturdy honesty, directness and simplicity", that he "primarily wanted to catch the essential character of the buildings," and that "they were a joy to draw." The same might be said to pertain to all of his work. 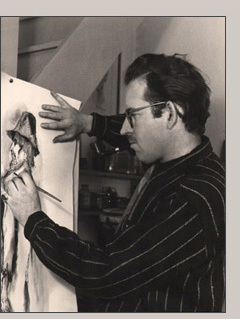 Ken, in the 1940's, joined The Cliff Dwellers, a renowned club in Chicago for artists and writers. 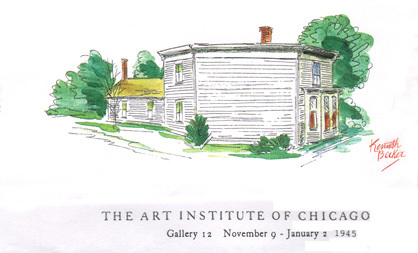 He was also a longtime member of The Arts Club of Chicago, frequently participating in members' exhibits. He was generous with his work, one might even say overly generous, forsaking it as business at times. When friends or visitors to his studio admired works he had just painted, they would often be sent home with them free of charge. He wanted the paintings up and on walls. He continued working for the company until the Chicago branch petered out in the early 1960's. He also lost an eye due to a detached retina and thought that he could no longer paint. In fact, he could and did and never stopped but it was without the same drive. He had periods of inspiration and great enthusiasm for life and for painting during these years but they were mixed with despair and the inevitable consequences of heavy drinking. He died of liver failure in 1972 at age fifty-nine. In 1973, The Art Institute acquired four of his watercolors for their permanent collection. His works are also in many private collections. Among his artist friends were Ivan Albright, Herbert Bayer, Gustave Bauman, Boris Anisfeld, Edgar Ewing, Max Kahn and many more. Kenneth is listed in "Who Was Who in American Art, 1564-1975", "Index of American Watercolor Exhibitions", "Jacobsen's Biographical Index of American Artists", "International Watercolor Annual", "The Annual Exhibition Record of The Art Institute of Chicago", "The Annual Exhibition of Works by Artists of Chicago and Vicinity", "American Painters and Sculptors", "Biographical Dictionary of Painters and Sculptors in Illinois, 1808-1945."